Joe DiPietro's exuberant jukebox musical is a loopy tale of mismatched lovers in 1955. A small town gets rockin' when a mysterious motorcycling stranger comes to this Midwest burg and changes it forever. 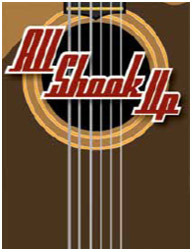 It's Shakespeare meets James Dean, set to the music of Elvis Presley! This "do NOT miss" event features such classic Elvis tunes as..."AIl Shook Up", "Bumin' Love", "Heartbreak Hotel", "Love Me Tender", "Don't Be Cruel", "Jailhouse Rock", "Teddy Bear", "C'mon Everybody", "A Little Less Conversation", "It's Now or Never", "Blue Suede Shoes", and many more. Bagpipes are deadly. Especially when they're played by a Highland Hitman who belongs to the Clan (With a C). Toss in incompetent cops, doughnuts, and clothes that slip down faster than a Floridian on ice and you've got Unnecessary Farce. A pair of cops have been assigned to spy on the mayor while he meets with a new accountant who has uncovered some serious embezzlement. The highly earnest and honest cops are convinced this will be their big break. Never mind that one is afraid of guns, the dark, and enclosed spaces and the other has been too shy to ask a woman on a date for years. All that is about to change. Produced through special arrangement with Playscripts Inc. 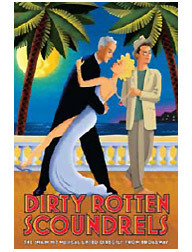 Dirty Rotten Scoundrels takes you to the French Riviera where two very funny con men try to out-con each other. Suave and sophisticated Lawrence Jameson charms wealthy women out of their money versus small-time crook Freddy Benson who plays on people's sympathies with his sob stories. When it becomes apparent that the Riviera isn't big enough for the both of them, they make a winner-take-all wager over the fortunes of the naive American soap heiress. The first one to "clean her out" can make the other clear out and keep the Riviera and its unsuspecting tourists to himself! This hysterical musical comedy will have you laughing out of your seat! Produced through special arrangement with Music Theatre International, MTJ. You will be laughing seven times over as you watch this rambunctious musical love story unfold. When Milly recited her marriage vows, she never realized she would find herself in the wilds of 1850's Oregon, with six rowdy brothers-in-law as roommates. It doesn't take long for her to whip this rough and tumble group of boys into shape, and soon all the brothers can think about is finding wives of their own. 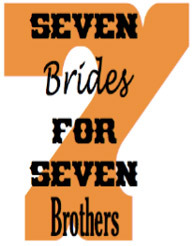 Based on the MGM film, Seven Brides/or Seven Brothers is filled with daredevil dancing and features a rip-roaring score including "Wonderful, Wonderful Day," "Bless Your Beautiful Hide" and "Sobbin' Women." Produced through special arrangement with Music Theatre International (MTI).